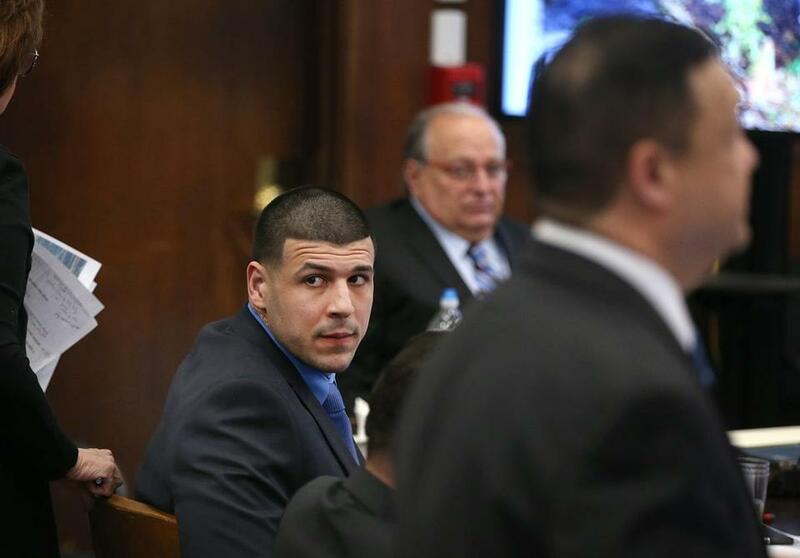 Former New England Patriots tight end Aaron Hernandez in court. At least five shots were fired in the 2012 double slaying that former New England Patriots star Aaron Hernandez stands accused of, a prosecution witness said Wednesday. Michael Haag, a private shooting reconstruction analyst, testified for more than two hours at Hernandez’s trial in Suffolk Superior Court. As he described the fatal wounds that Daniel de Abreu and Safiro Furtado suffered in the July 2012 drive-by shooting, de Abreu’s widow, Auriza, dabbed her eyes with a tissue and eventually left the courtroom with a victim witness advocate. Prosecutors called him to back up testimony from their star witness, Alexander Bradley. Bradley told jurors last week that he was in the driver’s seat of Hernandez’s Toyota 4Runner when the athlete reached across him and fired five shots into the victims’ BMW at a stoplight on July 16, 2012. Hernandez, 27, has pleaded not guilty to charges of killing de Abreu and Furtado. He has also pleaded not guilty to a witness intimidation charge for allegedly shooting Bradley in Florida in February 2013. Linda Kenney Baden, a lawyer for Hernandez, noted during cross examination that multiple witnesses to the double slaying reported hearing six shots. “You can’t say definitively that there were only five shots,” Kenney Baden said. “Correct,” Haag replied, adding that five shots could have caused the ballistic damage to the victims, their vehicle, and clothing. The defense claims that Bradley, an admitted drug dealer, shot de Abreu and Furtado over a drug transaction. Hernandez’s lawyers have also raised the specter of someone in the BMW returning fire. No guns were recovered at the scene, and police seized what they believe is the murder weapon in June 2013 from a woman with ties to Hernandez’s relatives. The 4Runner was found in a garage on the property of Hernandez’s cousin in Bristol, Conn., that same month. Bradley, currently jailed in Connecticut for an unrelated shooting in Hartford, testified for prosecutors under an immunity agreement. Also Wednesday, Judge Jeffrey Locke said prosecutors could rest their case as early as Friday. The trial began March 1. Locke ruled Tuesday that jurors will not hear a jailhouse conversation Hernandez had with his mother in which she made reference to the “bad things” he told her. 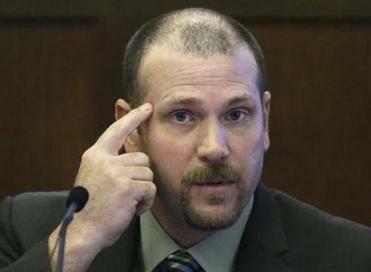 Forensics scientist Michael Haag described the bullet wound to a victim’s temple during Aaron Hernandez double murder trial Wednesday. The call was recorded days before Hernandez’s prior 2015 murder conviction for the fatal shooting of Odin L. Lloyd in North Attleborough two years earlier. Hernandez added, “I’m the only one that knew” Lloyd. The call also touched on personal topics, with Hernandez lamenting that he could not talk openly with his mother. In addition to the call between Hernandez and his mother, Suffolk prosecutors had also hoped to play a recording of another jailhouse conversation with Mike Pouncey, his former college teammate who now plays in the NFL. But Locke also denied that request Tuesday, ruling that the Pouncey call lacked enough evidentiary value to be admitted. Hernandez is already serving a life sentence for Lloyd’s slaying. An appeal of his first-degree murder conviction in that case will be heard at a later date. John R. Ellement of the Globe staff contributed to this report. Travis Andersen can be reached at tandersen@globe.com. Follow him on Twitter @TAGlobe.